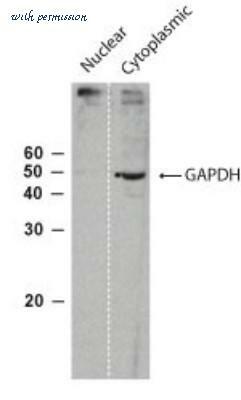 The GAPDH antibody from Proteintech is a mouse monoclonal antibody to a recombinant protein of human GAPDH. This antibody recognizes human, mouse, rat, zebrafish, yeast antigen. 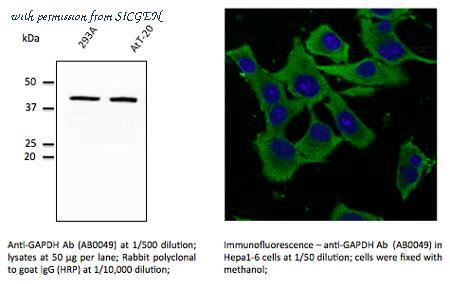 The GAPDH antibody has been validated for the following applications: ELISA, WB, IF, FC, IP, IHC analysis. 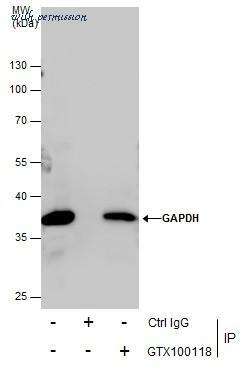 The GAPDH antibody from Proteintech is a rabbit polyclonal antibody to a recombinant protein of human GAPDH. 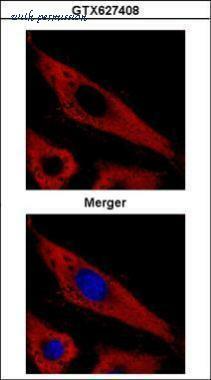 This antibody recognizes human,mouse,rat,pig antigen. 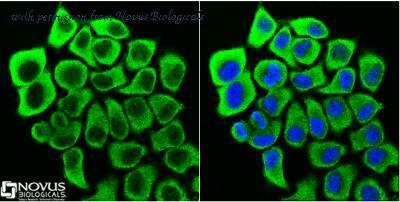 The GAPDH antibody has been validated for the following applications: ELISA, IHC, WB, IP, IF, FC analysis. 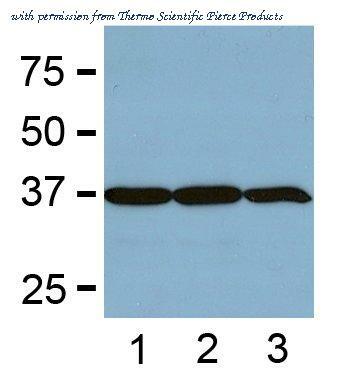 1:2000 (0.5ug/mL) Ab dilution used in WB of 5ug/lane tissue lysates from human (1), mouse (2), rat (3), rabbit (4), chicken (5), and hamster (6). 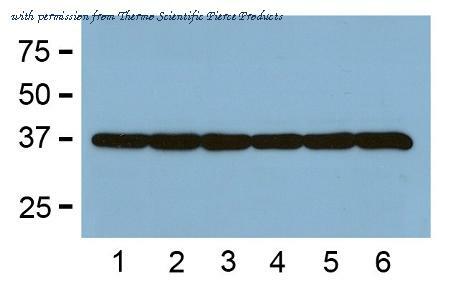 Western blot analysis of GAPDH was performed by loading 20ug of THP-1 whole cell lysates per well onto an SDS-PAGE gel. Proteins were transferred to a PVDF membrane and blocked with 5% milk in TBST. The membrane was probed with a GAPDH loading control monoclonal antibody (Product # MA5-15738) at a dilution of 1:5000 overnight at 4ºC, washed in TBST, and probed with a HRP-conjugated goat anti-mouse IgG at a dilution of 1:40,000 for 1 hr at room temperature. Detection was performed using ECL substrate. Data courtesy of the Innovators Program. 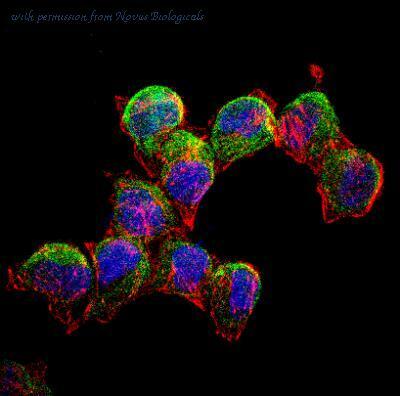 Immunocytochemistry/Immunofluorescence: GAPDH Antibody (1D4) [NB300-221] - SH-SY5Y cells stained with GAPDH antibody NB300-221 (green) and Neurofilament Heavy antibody NB300-217 (red), counterstained with a fluorescent DNA probe (blue). 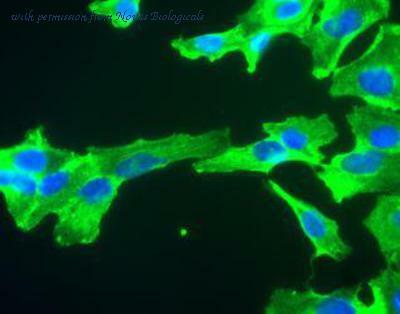 Immunocytochemistry/Immunofluorescence: GAPDH Antibody (1D4) [NB300-221] - SH-SY5Y cells stained with GAPDH antibody NB300-221 (green). Nuclear DNA is stained with Hoechst dye (blue). 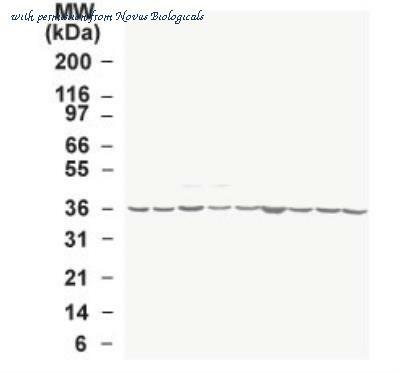 Western Blot: GAPDH Antibody (1D4) [NB300-221] - Sciatic nerves of mouse wild type (+/+), heterozygous (+/o) and homozygous (o/o) for knockout of peripheral myelin protein 21 (PMP21) were homogenized in SDS-PAGE sample buffer and run for western blot. 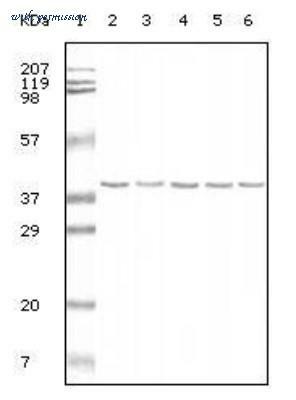 Blots were probed with NB300-221 GAPDH antibody. 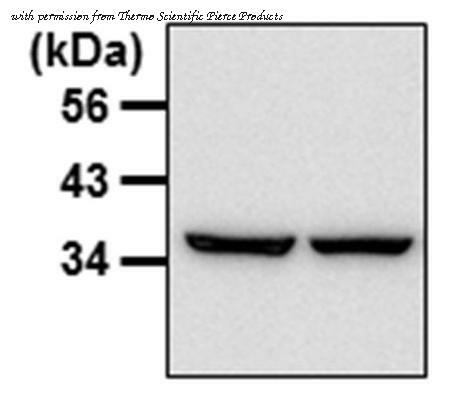 Western Blot: GAPDH Antibody [NB100-56875] - analysis of GAPDH in the multiple human tumor cell line lysate INSTA-Blot using this antibody. 25 ug/ml. 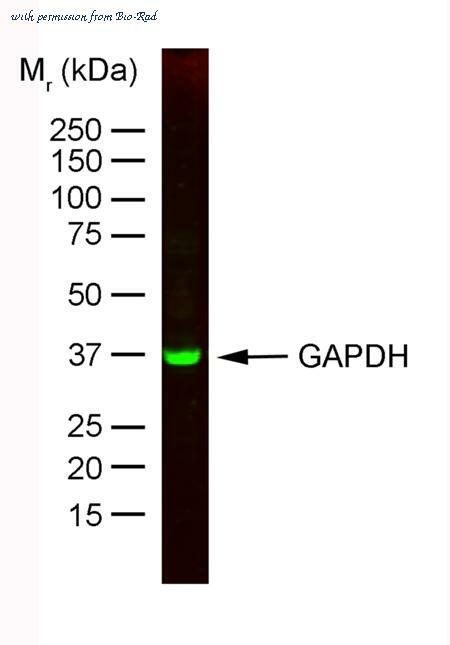 Simple Western: GAPDH Antibody [NB100-56875] - Simple Western lane view shows a specific band for GAPDH in 0.5 mg/ml of HeLa lysate. This experiment was performed under reducing A246conditions using the 12-230 kDa separation system. Western Blot: GAPDH Antibody [NB100-56875] - analysis of GAPDH using this antibody at 1:500 in nuclear and cytoplasmic fractions made from Drosophila head extracts. Data courtesy of Dr. Jerry Lin, University of Wisconsin-Madison. Immunocytochemistry/Immunofluorescence: GAPDH Antibody (2D4A7) [NB300-328] - Confocal immunofluorescence analysis of HeLa cells using GAPDH antibody at 1:50 (green). Nuclei were counterstained using DAPI (blue). Western Blot: GAPDH Antibody (2D4A7) [NB300-328] - Analysis using anti-GAPDH monoclonal antibody, against cell lysate (2: Hela, 3: K562, 4: Jurkat, 5: NIH/3T3, 6: HepG-2). Immunocytochemistry/Immunofluorescence: GAPDH Antibody (2D4A7) [NB300-328] - IF Confocal analysis of Hela cells using GAPDH antibody (NB300-328, 1:50). An Alexa Fluor 488-conjugated Goat to mouse IgG was used as secondary antibody (green, A). Actin filaments were labeled with Alexa Fluor 568 phalloidin (red, B). 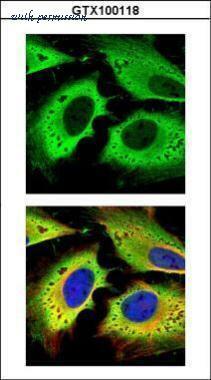 DAPI was used to stain the cell nuclei (blue, C). 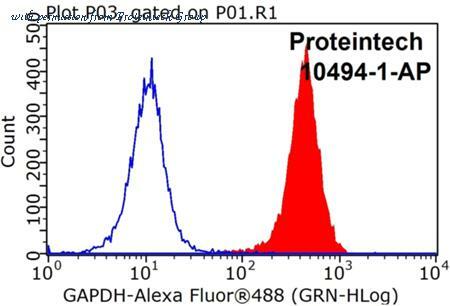 Immunoprecipitation of GAPDH protein from 293T whole cell extracts using 5 ?g of GAPDH antibody (GTX100118). 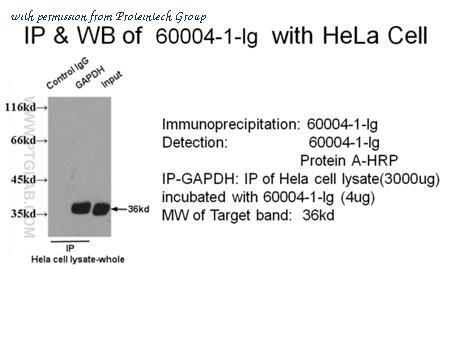 Western blot analysis was performed using GAPDH antibody (GTX100118). 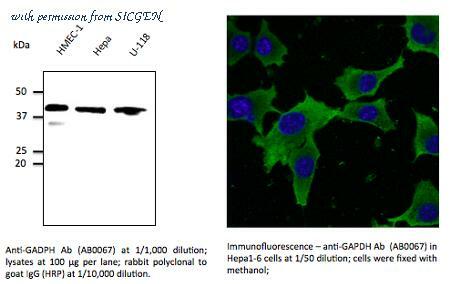 EasyBlot anti-Rabbit IgG (GTX221666-01) was used as a secondary reagent. 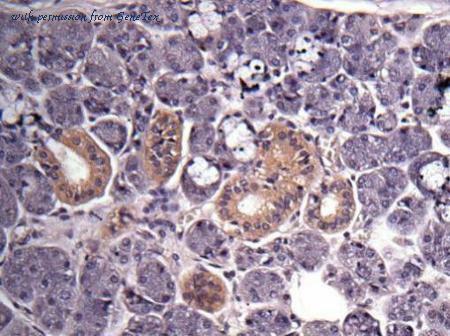 Immunohistochemical analysis of Salivary gland cancer, using GAPDH(GTX100118) antibody at 1:500 dilution. Confocal immunofluorescence analysis (Olympus FV10i) of paraformaldehyde-fixed HeLa, using GAPDH(GTX100118) antibody (green) at 1:500 dilution. Alpha-tubulin filaments were labeled with GTX11304 (red) at 1:2000. Confocal immunofluorescence analysis (Olympus FV10i) of methanol-fixed HeLa, using GAPDH(GTX627408) antibody (Red) at 1:500 dilution. 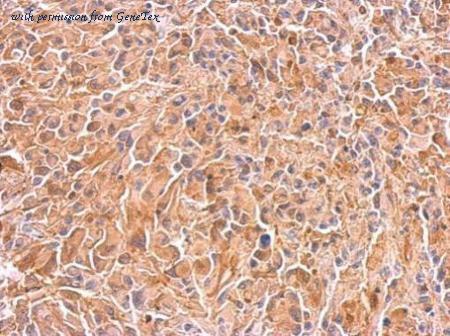 GAPDH antibody [GT239] detects GAPDH protein at cytosol on U373 xenograft by immunohistochemical analysis. Sample: Paraffin-embedded U373 xenograft. 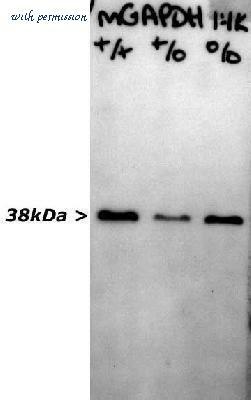 GAPDH antibody [GT239] (GTX627408) dilution: 1:200. Western blot analysis of mouse sciatic nerve homogenate probed with GAPDH mAb (1D4). Image kindly provided by Dr. G. Shaw, University of Florida. Detection of Human/Mouse/Rat GAPDH/G3PDH by Western Blot. Western blot shows lysates of mouse, human, and rat brain tissue. PVDF membrane was probed with 1 ╡g/mL of Goat Anti-Human/Mouse/Rat GAPDH/G3PDH Antigen Affinity-purified Polyclonal Antibody (Catalog # AF5718) followed by HRP-conjugated Anti-Goat IgG Secondary Antibody (Catalog # HAF017 ). A specific band was detected for GAPDH/G3PDH at approximately 38 kDa (as indicated). 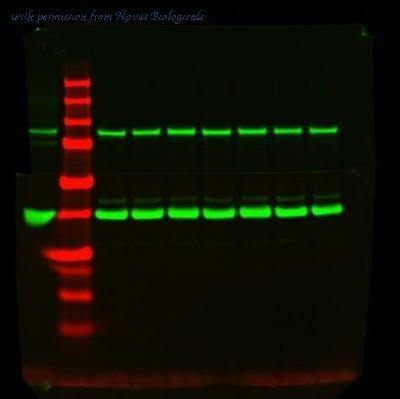 This experiment was conducted under reducing conditions and using Immunoblot Buffer Group 2 . 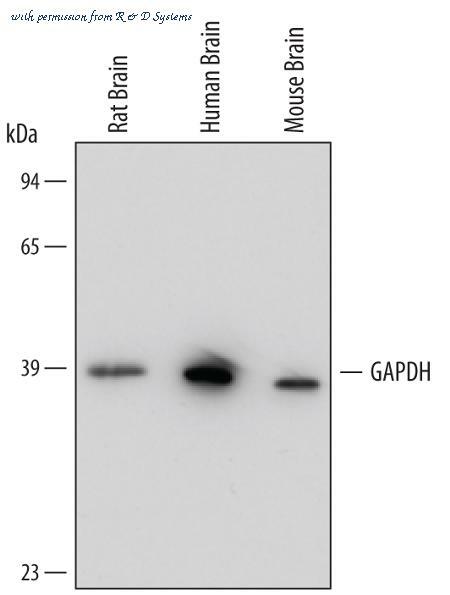 Detection of Human, Mouse, and Rat GAPDH/G3PDH by Western Blot. Western blot shows lysates of human brain tissue, mouse brain tissue, and rat brain tissue. 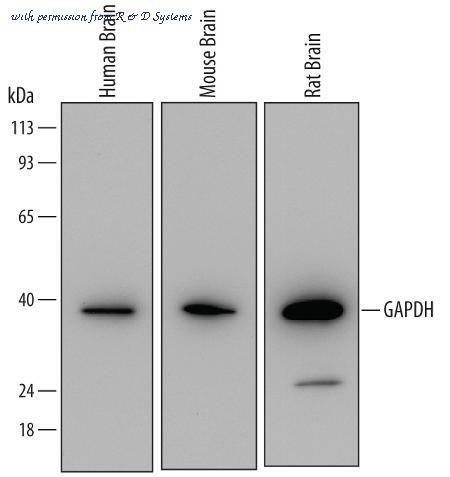 PVDF Membrane was probed with 0.05 ╡g/mL of Mouse Anti-Human/Mouse/Rat GAPDH/G3PDH Monoclonal Antibody (Catalog # MAB5718) followed by HRP-conjugated Anti-Mouse IgG Secondary Antibody (Catalog # HAF007 ). A specific band was detected for GAPDH/G3PDH at approximately 39 kDa (as indicated). This experiment was conducted under reducing conditions and using Immunoblot Buffer Group 2 .